Well there seems to be some discussion online about GHQ’s new Puma IFV being a bit oversized. I don’t have one to measure but when I get one I’ll do some research into this. While discussing this with a friend of mine he said “how about their toyota pickup?, it’s way too big”. It looked a bit big to me too so I did some research. 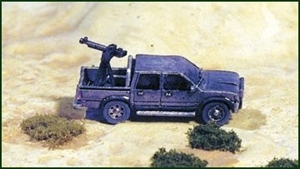 Conclusion, the GHQ Toyota Pickup is close to 1/285th scale with the exception of the length. The length of the model is 2 scale feet too long, which is interesting because the truck bed actually looks a little short. All the extra length seems to be in the cab area. 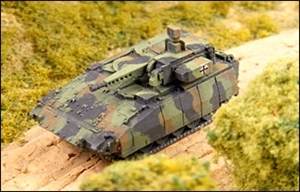 I’ll check out the Puma IFV once I get one. If you have one and a digital caliper please measure one for me and send me the dimensions. I think it’s worth mentioning here that it not my intention to beat up GHQ in this post. I am a HUGE fan of their products and have been for over 30 years and I prefer their products to their competitors. Anyone that reads my blog regularly will know this. As a matter of fact, a large percentage of my posts are about their products and how happy I am with them ….. but if there is a problem with a product and I know about it, I’ll let you know.